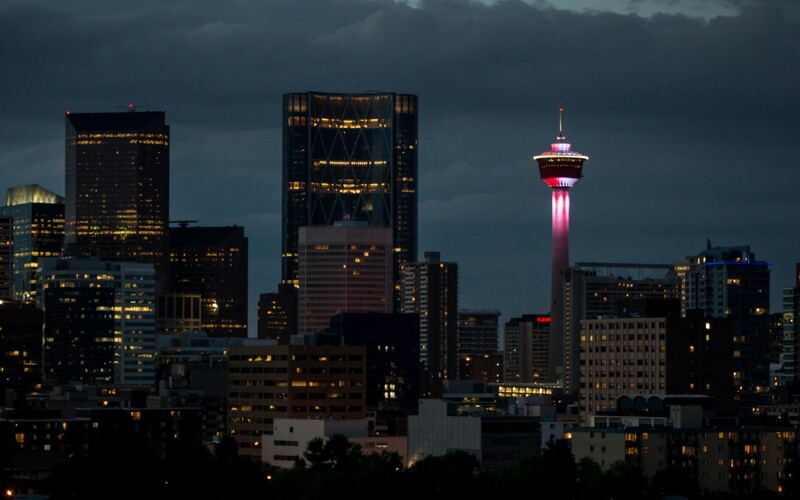 Local lighting designers Optics Lighting used Lumenbeam luminaires to bring the Calgary Tower back into the spotlight. 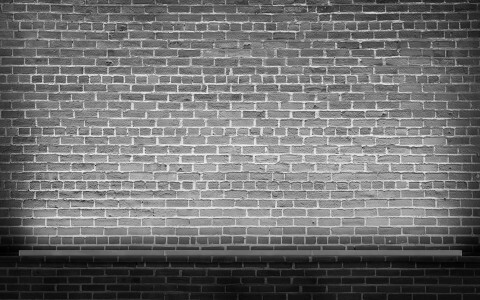 Optics Lighting replaced 24 Metal Halide fixtures lighting the underside scoop with 24 Lumenbeam Large Color Changing luminaires. Photo reprinted with permission of the Calgary Herald. 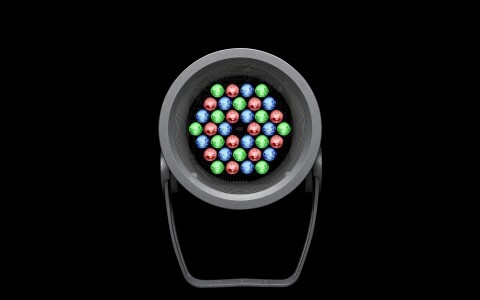 Lumenbeam Large Color Changing luminaires were then used around the railing system circling the dome, and on the crown. Significantly reducing wattage, the luminaires are installed between doors and lifted into the interior, allowing for easy maintenance. 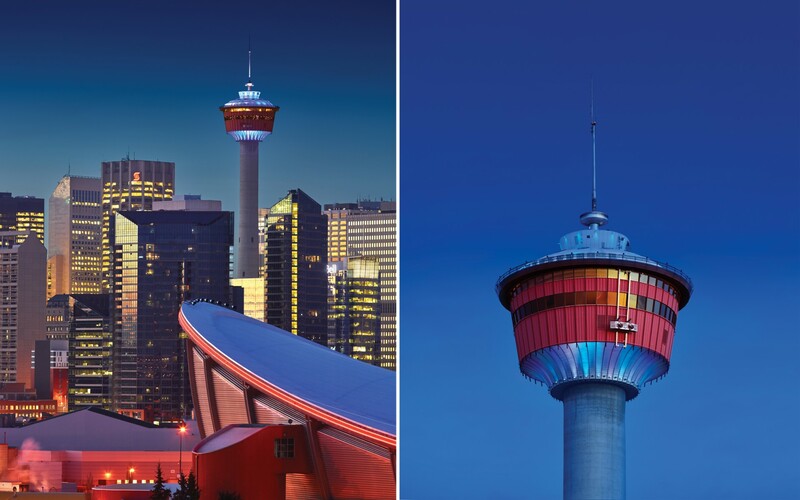 Optics Lighting used Lumenbeam Large and XLarge luminaires to put the Calgary Tower back in the spotlight in an ever-crowded downtown skyline. There are a lot of reasons to use Lumenpulse in my books: the products are solid and easy to work with; they provide great quality and value; and best of all, they’re Canadian made. 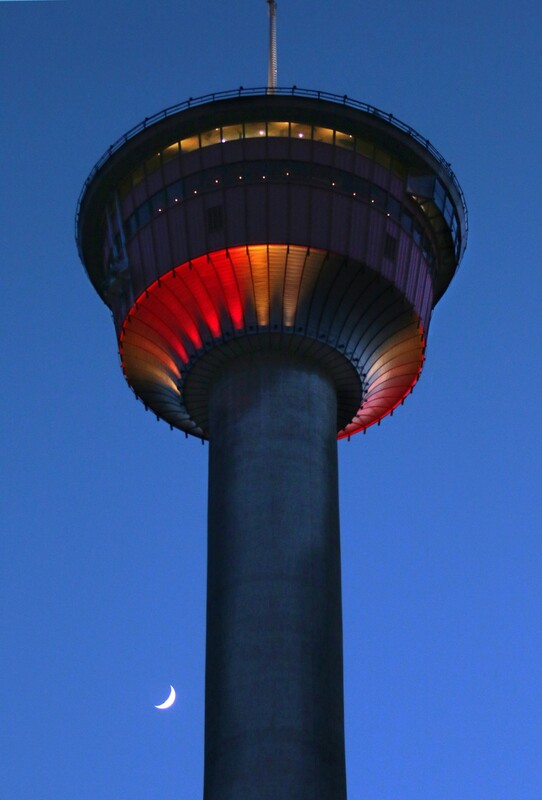 Inaugurated in 1968, the 626ft-high Calgary Tower has been an enduring symbol of the city. Calgary's recent construction boom, however, had started to crowd the tower out of the downtown skyline. 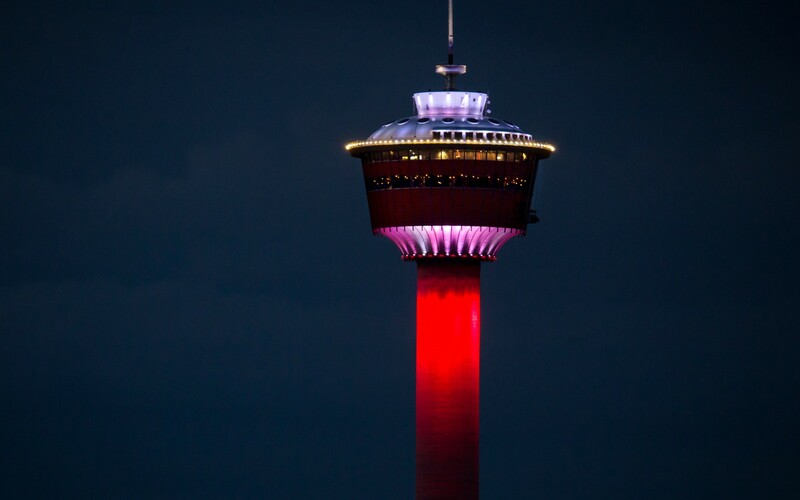 To re-energize the structure, the Calgary Tower turned to local lighting designers Optics Lighting. 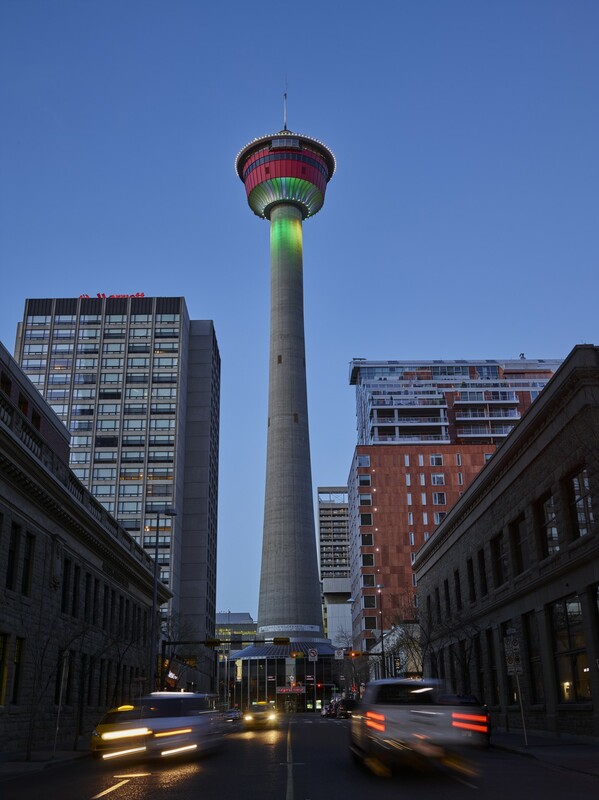 "The Calgary Tower was once the highest structure in Calgary, but now that taller buildings have been built around it, it gets a bit lost at night. The goal was to develop a dynamic lighting design that brought it back into focus," said Dan Hadash, lighting designer at Optics Lighting. "But we also wanted to reduce maintenance issues and improve performance. Having to change lamps on the tower is very challenging, and because it's a round structure, even if one lamp goes out, you see it. It's highly visible," he said. 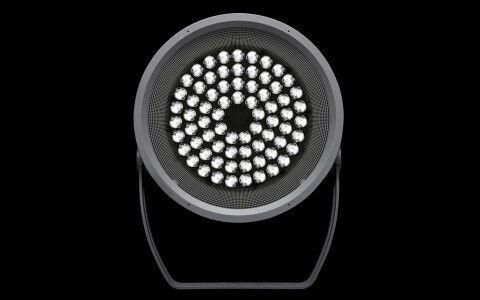 Optics Lighting chose Lumenpulse's Lumenbeam family of luminaires. 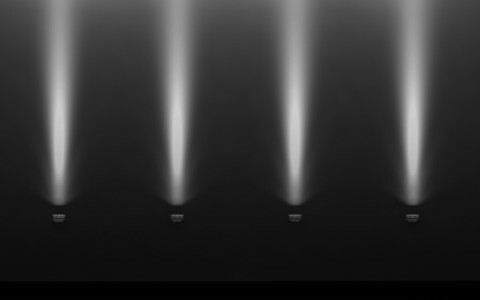 "There are a lot of reasons to use Lumenpulse in my books: the products are durable and easy to work with; they offer great lifetimes and performance; and best of all, they're Canadian made," Hadash said, adding that the lighting concept pays tribute to an important Canadian sporting event: the 1988 Olympic Games in Calgary. 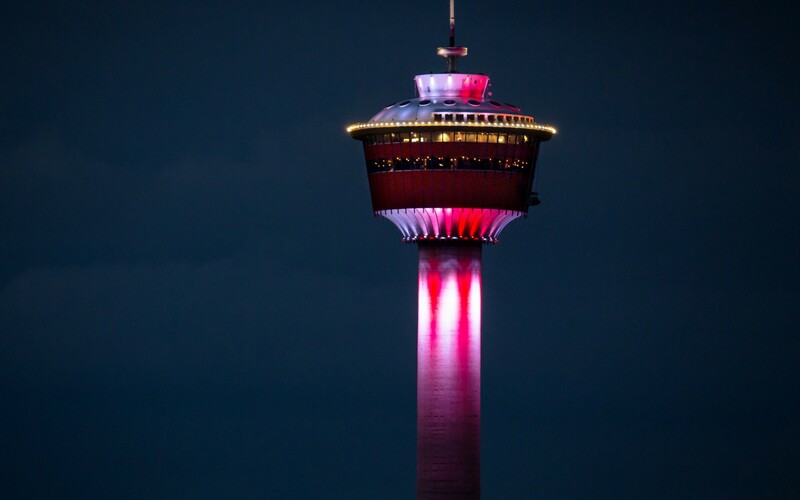 "If you look at the torch in 1988, it looks like the Calgary Tower, and I wanted to replicate the torch effect, to recreate the same feeling I had as a kid, when that torch went by," Hadash said. Optics Lighting replaced 24 Metal Halide fixtures lighting the underside scoop with 24 Lumenbeam Large Color Changing luminaires. Significantly reducing wattage, the luminaires are installed between doors and lifted into the interior, allowing for easy maintenance. Finished in white, the luminaires are hidden against the white of the scoop, making them disappear from below. "We tried to create these pools of light, so that changing colors didn't bleed into each other very much. It's the only round structure downtown, so we used shadows to give it some depth, to really emphasize that shape," Hadash said. "There are holes around the crown of the 88' Olympic torch, and you can see the flame flickering through it. To recreate that, we pointed the fixtures straight up and down at the structure, so that they're producing little points of glare, giving it a sparkle, like the torch had," Hadash said. Three Lumenbeam XLarge luminaires in 4000K were then used to light the spire. Durable, dimmable and fully programmable, the new lighting design has reduced the Tower's operational costs, and helped re-establish its place in the city's growing skyline. "Every time we do a special show on it, or change a color, people post pictures on social media," Hadash said. "It's really brought the tower back into the spotlight."